We all play roles in our work and home lives and often are assigned these in childhood by our family. We are the ‘bossy one,’ ‘the baby,’ or ‘the black sheep.’ These roles trail us into adulthood and they become our default setting when we are faced with big events — cataclysmic grief, heady love and loss. The roles we are all cast to play both conceal and reveal us. 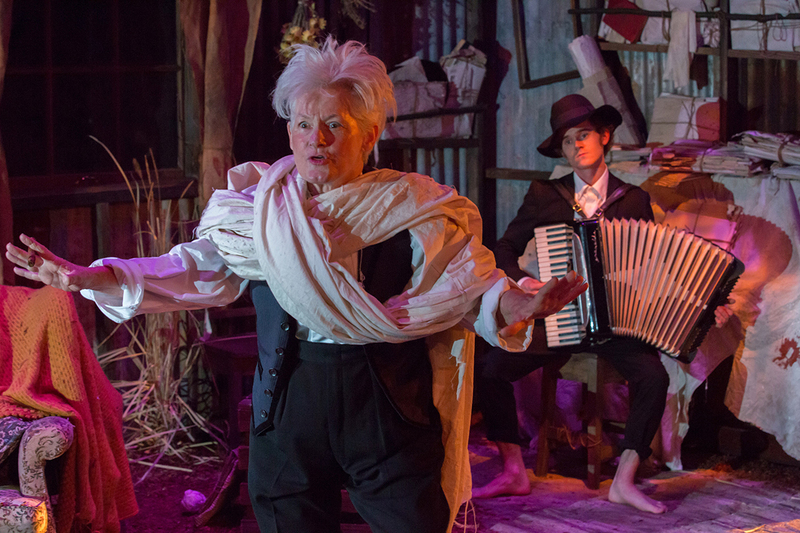 Enter the self-proclaimed ‘comical woman,’ a part both played and railed against in He Dreamed a Train and Eve, the double bill from inimitable Brisbane theatre maker Margi Brown Ash. He Dreamed a Train, directed by Benjamin Knapton, is a paean to a loved brother and an intimate encounter with one family’s experience of loss. The work is inspired by real events — the degenerative neurological disease that prematurely claimed the life of Margi Brown Ash’s brother. We are warmly invited to bear witness to her grief, and share in it too. 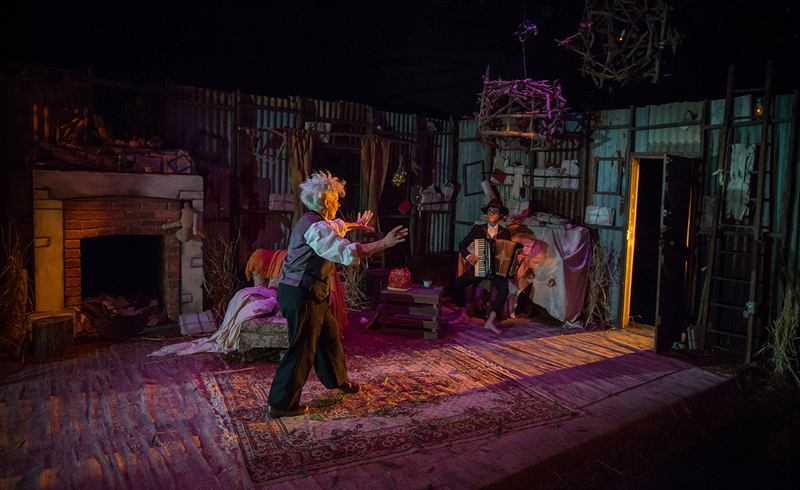 The show opens when the bereft narrator, Margi, returns to the family home, to pack up her brother’s belongings and excavate old memories, perhaps in order to make some sense of the tragedy to herself. There are still things she has to say to him. The brother presents as a dreamer type. He is visionary at times — his idea to revitalise regional communities by linking them with a monorail holds a kind of wacky genius appeal. Yet he infuriates in his refusal to accept treatment or find ways to stymie the onset of his symptoms. Margi tells us what she cannot say to him: that if it were she who was sick, she would try everything — yoga, Pilates, acupuncture, the works — to stave off illness. This treads the line of the tragicomical, sort of like drinking a green juice to combat cancer; it might help, but it does not address the larger issue. When those you love are dying, there are conversations that are just too difficult to have. Instead we try to fix things through action, in this case with helpful suggestions for alternative therapies. The set is comforting; it could be any one of our lounge rooms and we are lulled by its familiarity. Except of course for a lone picture on the wall. A seemingly innocuous sky scene, one might find in an old opp shop, becomes a beautiful digital image, evoking Brown Ash’s emotional landscape. Just as what remains unsaid builds in momentum, the painting is a living artwork throughout: the clouds rain, the heavens open, the sky bleeds down the wall. 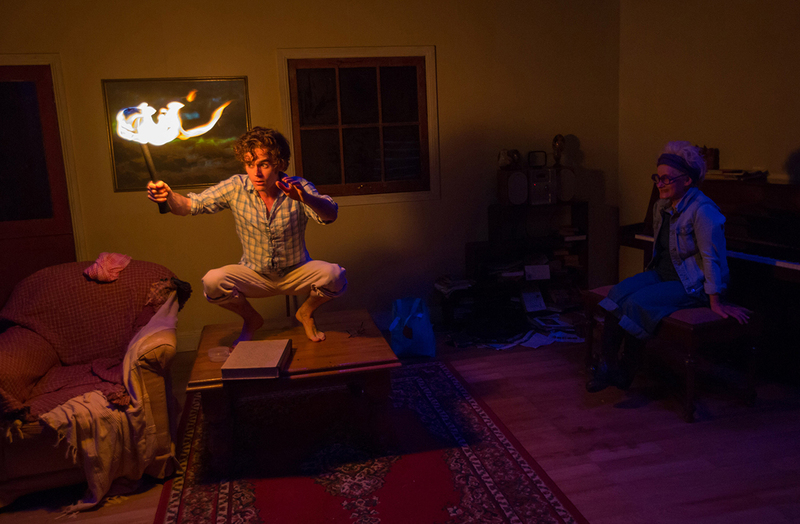 Time jumps into the childhood home where the characters are visited by their younger selves, entertaining each other with mythological tales, dragon legends and their own creation stories. The most potent of these are train moments — the children playing chicken in a train tunnel, a family legend which becomes significant later in the work. But the grieving sister cannot stay silent in the end and refuses to be diverted by these ghosts. At one point Brown Ash demands to speak not with the 25-year-old version of her brother, charmingly rendered by performer and musician Travis Ash, but “the sick old man” who has let them all down by dying too young. Her anger in this moment is palpable and affecting. The ‘comical woman’ has been cast aside. This is the kind of role that floats away like vapour when there is no one left to play with. Yet all families have creation myths, stories we tell and retell. In them, no one dies, not really. The lost loved one is always there, just behind the clouds in the picture on the wall. Eve, which was first staged in 2012 and is directed by co-devisor Leah Mercer, sees another figure struggling with the roles she is expected to embody. This show is a gloriously exuberant ‘biopic’ of the life of Australian novelist and poet Eve Langley (1904-1974), billed in the program as Australia’s answer to Virginia Woolf. This time, Brown Ash as Eve ricochets between the roles of ‘brilliant writer’ and ‘wife and mother,’ delivering moments of humour and pathos in equal measure. We first see Eve banging away furiously on her typewriter in an iron tub in a bathroom open to the elements: a kind of a lean-to off her bush hut. She appears to be hiding out from the prosaic demands of her husband and small children, snatching precious moments with the muses where she can. Margi Brown Ash draws on the artist’s published and unpublished writings to offer us a glimpse into the cosmos that is Langley’s interior world. In this makeshift room of her own, Eve dips deftly in and out of bush poetry, religion, astronomy and mythology. Her mind is nimble, and her ability to weave together these tangents to create vivid and startling imagery, gives us an insight into its dazzling velocity. Brown Ash’s performance of these excerpts matches the verve and wit of Langley’s writing. As Eve works in the bath, manuscripts tied with string drop with a thud from the ceiling. We are lovingly introduced to these works as if they are her children. However, some of these parcels contain rejection slips. We also learn Langley was a furious correspondent, hilariously advising booksellers that she is happy to accept returned manuscripts only if addressed to Oscar Wilde, since he could ostensibly handle them better than she. Her acerbic sense of humour is highlighted; the ‘comic woman’ is a role Langley evidently both played and downplayed. She wears a topee hat, men’s strides and appears to cultivate a wild bush raconteur’s demeanour. Humour is her way of handling what cuts her to the quick, yet Eve longs to be recognised as more than amusing. Perhaps it is the rejections that prompt Eve to return to her domestic role and its responsibilities for a time. After a spate of creativity, we see her cross the threshold into her home proper. In this role she is less successful, although she does try. Eve’s mind shrinks, not soars. The detailing of the set, designed by Aaron Barton, is incredible, evoking the sort of household objects and collectibles found in a Margaret Olley painting. But all this is a distraction for Eve, just more stuff crowding her already busy brain. Domestic miscellany is too much in the end, or perhaps not enough. The artist cannot deny her true self and write she must, drink in hand all through the night and even as the sun rises, family be damned. In this retelling, Eve solves her childcare problem by upending her babies on the mantelpiece. By standing them on their heads, she reasons, they cannot fall — genius in its madness. Her husband has her committed to a mental hospital, nonetheless. After her release, Eve continues to write, though she will struggle with the duality of these roles for the rest of her life. Ironically it is her adult children who, upon their mother’s death, discover a cache of Langley’s writing secreted away under her bed, as Emily Dickinson had done. It is they who marvel at her words, her true essence, concealed for so long and they who vindicate past neglect. 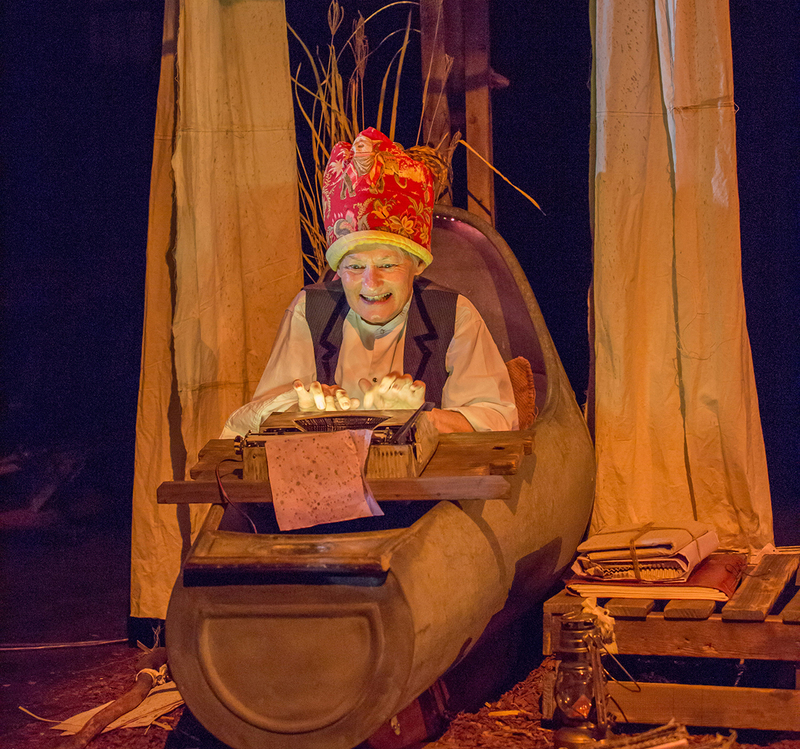 As a woman writing at a time where the roles of ‘wife and mother’ and ‘artist’ were often seen as mutually exclusive, Eve explores the theatre of playing house while needing to create and inhabit other imaginative worlds. The tragedy of Eve Langley’s life was not that she was denying her true self — the artist was fully aware that she needed her writing to ground herself. She had two great loves, her family and her work, but it was demanded that one be chosen at the expense of the other. 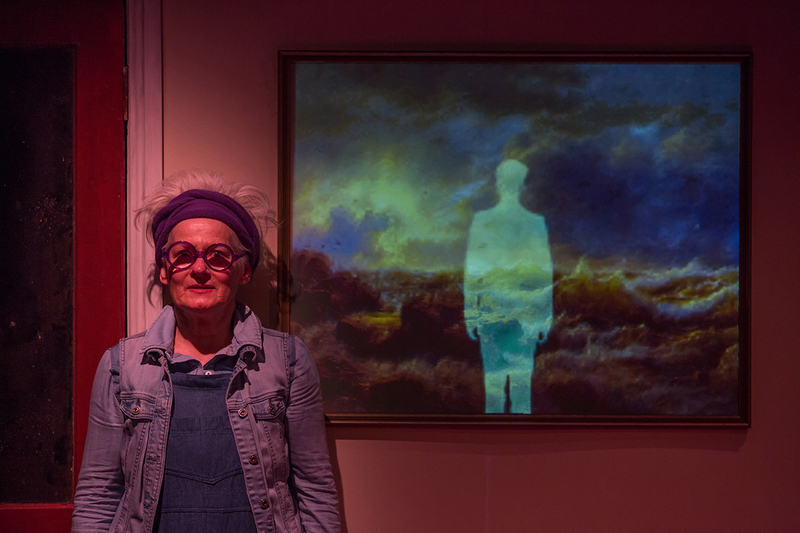 Eve and He Dreamed a Train are linked thematically by their bush settings, their artful tapestry of mythology and personal story and by Margi Brown Ash’s disarming impulse to stop for a cup of tea mid-show. We too are invited to pause and consider the roles we play, to look through and break out of them. That is the great, generous gift of Margi Brown Ash in works, crafted with skill and love. Victoria Carless is a writer living in Brisbane. Her first novel, The Dream Walker, was published by Hachette Australia in July.